Conserve lab benchtop space with the new Qsonica Q55 Sonicator Ultrasonic Processor—measuring only eight inches wide and less than eight inches deep. Use it for cell disruption, nanoparticle dispersion, emulsions creation, DNA shearing, ChIP assay, and homogenization. The 55-watt, 20 kHz unit effectively handles most small-volume applications. Functionally, it is easy to use, with thumb-switch or continuous operation. Choose from 110 VAC to 220 VAC models. 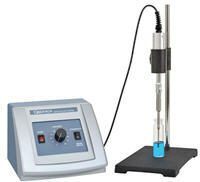 Product includes 1/8" diameter probe; additional probes are available in three sizes. For more information about the Qsonica Q55 Sonicator Ultrasonic Processor, including product specifications, call 800-323-4340 or visit ColeParmer.com/18687.